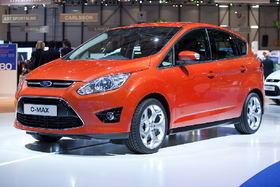 The C-Max is one of five battery electric and hybrid models Ford plans to sell in Europe by 2013. Ford Motor Co. will build the company's first hybrid models for European customers in Spain. Ford's factory in Valencia, eastern Spain, will build full hybrid and plug-in hybrid electric versions of the carmaker's latest C-Max five-seat minivan starting in 2013. "These new advanced technology models are key to Ford's commitment to delivering a portfolio of alternative powertrain vehicles globally and to European customers in the next few years," said John Fleming, Ford of Europe CEO, in a statement. Valencia will produce gasoline and diesel versions of the new-generation C-Max and the seven-seat Grand C-Max minivans, which both launch in Europe in the second half of the year. The Grand C-Max will be exported to North America starting in late 2011, where it will be badged as the C-Max because the U.S. will not get the five-seat European C-Max. Ford's total investment in the new C-Max program in Spain over the next three years, including the hybrid models, is almost $410 million. Investment in the hybrid programs is expected to be up to $36 million. The Spanish government and the Valencia regional administration are providing aid to Ford in line with their goal of establishing Spain and the Valencia region as important centers for advanced research and development in environmental engineering. Ford said the exact amount of state support will be determined at a later date. Ford said it has significant experience with hybrid vehicles in North America and "will now extend this expertise to Europe as part of the company's aggressive global electrified vehicles strategy." The C-Max hybrids are part of Ford's plan introduce five battery electric vehicle and hybrid models in Europe by 2013, including the full battery-electric Ford Transit Connect, already announced for 2011, and a battery-electric derivative of the next-generation Ford Focus, due in 2012. The fifth vehicle will also be a hybrid-electric model and will be announced later, Ford said.